Israeli bulldozers razed lands and uprooted olive trees in Palestinian lands adjacent to the Israeli illegal settlement of Avnei Hefetz, in the northern occupied West Bank district of Tulkarem, on Thursday morning. The Avnei Hefetz settlement was built on Palestinian-owned lands of the villages and towns of Shufa, Kafr al-Labad and Kafa. 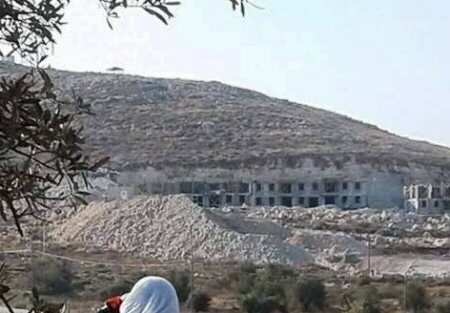 Activist Tahsin Hamed reported, acording to Ma’an, that Israeli bulldozers razed Palestinian-owned lands in the Shufa village of southeastern Tulkarem, in preparation for settlement expansion. Hamed pointed out that the village is currently wall-to-wall with the settlement, and is continuously facing land-razing for the expansion of the Avnei Hefetz settlement. Israel’s policy of expanding settlements and outposts has been escalating recently, due to the United States President Donald Trump approving three times more the amount of settlement units than that which was approved in the year and half before his inauguration. Since the occupation of the West Bank, including East Jerusalem, in 1967, between 500,000 and 600,000 Israelis have moved into Israeli settlements located in occupied Palestinian territory, in violation of international law. The estimated 196 governments recognized Israeli settlements scattered across the Palestinian territory are all considered illegal under international law.